Ivy is not easily confused with other wild plants on this web site. This is an evergreen climber which clings by means of tiny stem roots to masonry, trees, cliffs and rocks and which carpets the ground in dense shade and under hedges. The early leaves are three or five-lobed, shiny dark green with pale veins and the more mature leaves are often heart-shaped. The leaves remain on the plant throughout the year and from September to November they are joined by little yellow-green flowers (8–10 mm across). These have five pointed lobes and five prominent stamens, are borne in umbels. In the following spring, the berries develop, ripening purple-black. These are poisonous if eaten in quantity and it might be useful to know that the sap contains an irritant to the skin which can induce dermatitis. This is a native plant and it belongs to the Araliaceae family. 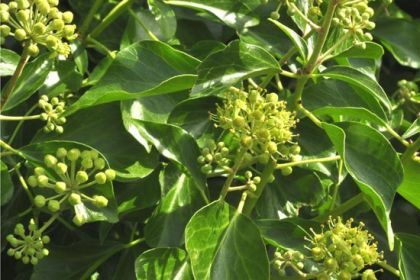 Also found less commonly in Ireland is Hedera helix, with some small differences but best differentiated from Hedera hibernica by having whitish rather than light brown hairs on growing tips. Some of the little hairs on the leaves project from the leaf-surface in Hibernica helix, whereas they lie flat to it in Hedera hibernica. I first recorded this plant in Dalkey, Co Dublin in 1976 and I photographed it in Gibletstown, Co Wexford in 2009. 'An ivy leaf heated and put on a corn relieves the pain'. From the National Folklore Collection, University College Dublin. NFC 36:249. From Laois. 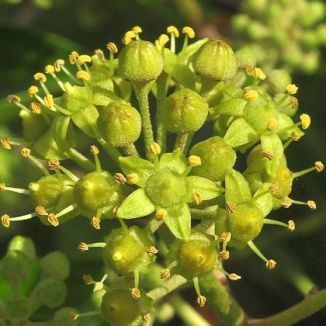 A familiar evergreen, most would know Ivy as a partner to Holly in a Christmas carol; Ivy has always been a symbol of fidelity and was frequently interlaced through the flowers in a bridal bouquet. In autumn, Ivy is the most important foodplant of the Holly Blue butterfly and it is also an overwintering site for the Brimstone which takes shelter under the evergreen leaves.